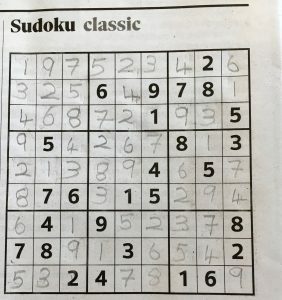 There are many skills that I have had to either adapt, do differently or just give up on over the past five weeks so I’m feeling very pleased to have completed the Saturday Guardian Sudoku, not because of my logic, non-verbal reasoning or ability to count up to 9 but because I’ve used my right hand (not my writing hand). It’s taken me five weeks to master this skill after I fell and broke my left wrist. I say writing, but numbers were far easier to master than my attempts at writing the weekly shopping list legibly on a whiteboard in the kitchen. I will spare you a picture of what looks like infantile scribble that has been the source of great amusement for my family. I had assumed that I was ambidextrous and sufficiently competent at writing with my right-hand for it not to be a problem. It is an example of what Noel Burch classified as a “conscious competence” learning model; the psychological states that are involved in transforming skill incompetence to competence or outright mastery. I thought that I could easily cope with using my right hand (unconscious incompetence) but very quickly discovered that whilst I could do some things, writing wasn’t one of the them (conscious incompetence) and so I have had to consciously think about how to form letters and numbers to gain some level of legibility (conscious competence) and I would suggest that I am nowhere near the level of unconscious competence where I can write without having to think about it. Ellen Langer would call this a form of mindfulness and her book and You Tube video on why mindfulness matters resonated with my predicament. It was only when I was confronted with having to find a new solution to a familiar task that I became mindful and Langer would argue, opened myself up to creative possibilities and new ways of thinking. For me, it was simple expediency in order to get the job done. Why on earth would I consider writing with my non-dominant hand if I didn’t need to? What possible advantage would this give me? And yet interestingly, by slowing down and having to pay attention to writing numbers I seem to have become more successful at completing them. Having to think about the content of emails to dictate to the computer has also meant I have had to quite literally, think before I speak. It was this thinking that Daniel Kahneman argued contributed to the economic crash, with those in the financial sector continuing to approve loans (without thinking) even when the situation changed and demanded attention. In a very real sense they were blind to the obvious signs of disaster. And neuroscience is also demonstrating that paying attention in a mindful way releases the chemicals necessary for us to be creative and innovative, so that we can seek new solutions to old problems. Thankfully, my hand will heal and hopefully financial institutions have learnt lessons from the recent economic crisis about the importance of paying attention, slowing down and becoming mindful of the little things that make a big difference. I would urge you to try it yourself by doing a simple task with your non-dominant hand (brushing your teeth) or fold your arms the opposite way, and notice how you have to slow down and consciously think about what you are doing. Then use this approach to look at a problem or familiar task and ask yourself, if you knew that by being more mindful and paying attention will make you more creative and innovative, what will you change?